Five restaurants in Scotland have achieved a Top 50 listing in the 2017 Good Food Guide (GFG). Leading the Scottish entries is Restaurant Andrew Fairlie at Gleneagles. The restaurant is praised for "applying a modern sensibility to dishes" while reflecting the "refined traditions of French haute cuisine". Glasgow as a city is singled out for comment and is said to have had "a real boost" to its dining scene. GFG, which is owned by Waitrose, describes itself as a guide to the very best restaurants and eateries across Britain. 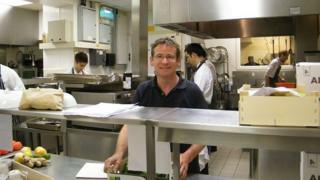 Restaurant Andrew Fairlie ranked at number nine in the overall UK list. GFG editor Elizabeth Carter said: "Unimpeachable ingredients are at the heart of Fairlie's culinary endeavours, from the Gartmorn Farm duck served with ceps to the seasonal pickings from his flourishing two-acre garden. "At the stoves, he's a master technician, eloquently schooled in the refined traditions of French haute cuisine, but applying a modern sensibility to dishes that always feel newly minted." Other top-listed Scottish restaurants were The Peat Inn in Fife, and two venues in Leith - The Kitchin and Restaurant Martin Wishart. A new entry in the Top 50 was Castle Terrace in Edinburgh, run by chef-patron Dominic Jack. Singled out as the best new entries in the Top 50 were Aizle in Edinburgh, Birlinn on the Isle of Skye, Eusebi Deli in Glasgow and North Port in Perth. Glasgow has seen a substantial increase in its entries to GFG for 2017. Ms Carter commented: "The redevelopment of the Finnieston dockyards and warehouses has helped to give a real boost to the Glaswegian dining scene, with many of the new venues offering a distinctly urban, modern approach, including stripped-back decor and small-plate concepts." Included in a special Longest Serving category for restaurants which have featured in many editions of the guide was Ubiquitous Chip in Glasgow, which has been listed for 45 years. Others in this category were Airds Hotel in Argyll and Bute, Ostlers Close in Fife, The Three Chimneys on Skye and Crannog in Fort William. The Whitehouse in Lochaline is praised in a desserts section, a new addition to GFG. Its North of the Border Tart is described as "filled with dried fruits, cherries, nuts and whisky. Nothing fancy, no towers, or twirls or crisps, just a really comforting pud." The Whitehouse was also listed as Scotland's Local Restaurant of the Year.